The garden is the hub of what happens at EL POCITO, where eventually everything we would otherwise have to buy – food/ medicine/ fuel/ building materials/ and much more – can be found. Our first ever experience at having a “proper” garden (an edible one) came when we moved to Yorkshire. We were in our mid-thirties then and the first big pesticides scare had just hit the news. I think everyone was seriously concerned, but for some reason we felt also that we should be doing something about it ourselves, like trying to grow our own food without it. And at exactly the same moment next door a piece of land came up for sale, one acre of derelict orchard. So to avoid future development of that, and to try our hand at growing, we bought it. But what really set us off in the direction we are on now was discovering the work of Lawrence Hills. First through a tv programme called All Muck & Magic, then reading the book of the series. Followed swiftly by a visit to where it was all based, the demonstration gardens in Ryton (Coventry). And finally becoming members of his amazing organisation – the HENRY DOUBLEDAY RESEARCH ASSOCIATION (which sadly no longer exists). That subsequently put us in touch with all the other luminaries of the organic movement, like Eve Balfour (SOIL ASSOCIATION)/ Rudolf Steiner (BIO-DYNAMIC ASSOCIATION)/ and Robert Hart (proponent for forest gardening). Who together proposed for the first time that the world had an international standard for food safety (the organic & bio-dynamic symbol scheme), creating a huge global movement dedicated to finding even more ways to make the planet greener. What we learnt and achieved during that period of living in Yorkshire (1987-2000) felt impressive. Not just to us, but sufficient to attract the attention of most of the national gardening press, who came to write about what we were doing. But it wasn’t until we were living in the remote mountains of Galicia (2001) and saw how they grew their food, did any of what we’d read and dreamed about begin to make any real sense. 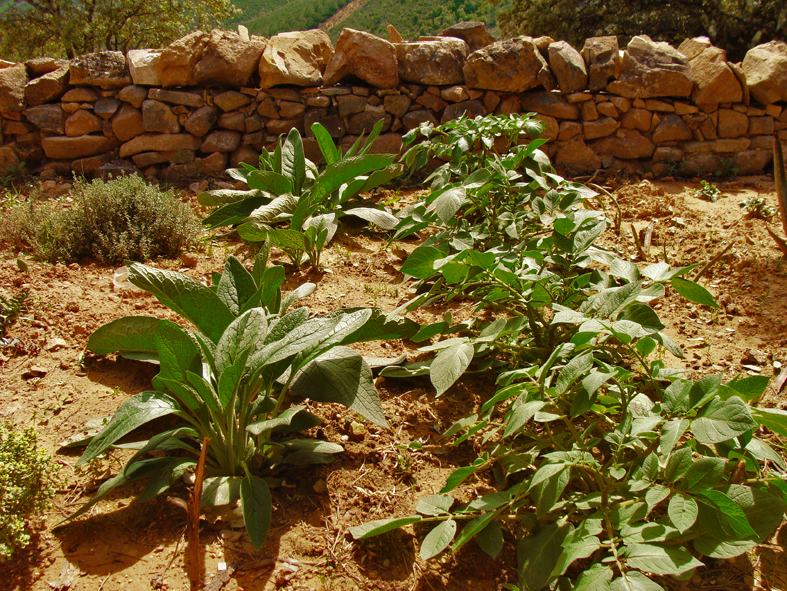 For despite being a region that had only recently been connected to the rest of Spain and the outside world by roads and other forms of communication, they still choose to resist the temptation to buy their food, choosing instead to continue growing it all themselves, and without the need to use any of the latest agricultural chemicals. What had served them for centuries stills feels better than anything new. This is because deep down, without having to articulate it or understand the long-term effects of the food industry, they know that industrial produced food is neither sustainable or good for them. Which was impressive and heartening. To know that despite requiring of them a much harder physical life, one that would scare even the most hardened of the new breed of organic gardeners, there are still whole ancient communities in existence in modern european countries who refuse to bow to the overwhelming pressures to become part of having to earn and pay for everything with money. Literally thousands of people living like this. Who because they don’t want to leave what are the last truly remote rural areas, this has to be their way of life. And why not. Why waste what for all of us is a short life having to earn an income when you can grow everything you need instead. Not just food they are self-sufficient in, but wine/ wool and linen/ fuel/ and building materials too. And in the process live longer and in the best locations possible. A quality of life even the most wealthy could never achieve. For despite being affected just like everyone else by the deadly global pollution of nuclear power and other air-borne nasties, all the people we met were a lot fitter and stronger than us and significantly much older (between 70 and 110). We couldn’t have chosen a better place to learn how to do this properly. Galicia is not only one of the least populated areas of Spain, it has few parts with flat arable land, the majority being on steep slopes and with solid rock close underneath. To grow on this challenging landscape the terrace has been invented. Fashioned over hundreds of years by successive generations, they radiate out from each aldea (village), with an extended family owning around 3-4 hectares worth. Rarely though as a single piece, or farm as we would expect, but composed instead of many fincas (plots/ allotments), scattered piecemeal, acquired through inheritance and marriage, and varying dramatically in size. Some as small as 2 m2, most the size of an allotment, and often as far away as the next village. The area we lived in had been seriously depopulated and many of these pieces of land were abandoned, and it was on a handful of these we started our higher education. The first challenge to clear them of weeds, then decide what and when to plant. We had arrived in the middle of winter, and despite being a lot further south than North Yorkshire quickly discovered it was just as cold, and considerably wetter. Especially at an altitude of 600 m, where for much of those first months the days were spent inside the clouds. Then just as we got acclimatised to that, along came spring and everything changed again. The cloud disappeared and we saw the sky for the first time, which was so blue nobody back in the UK believed it was real. At the same time the temperature soared. This was the beginning of March. And overnight the effect was to literally turn everything into a luminous green, from all the fresh growth. Of wild herbs/ grasses/ shrubs/ and trees. It also continued getting hotter, until eventually I thought we must have missed spring and gone straight into summer. But no. Every now and then, right through ‘til June, the cold weather would suddenly return without warning, freeze everything, then heat up again. Schizophrenic. Summer always started on the same day, the fortieth of May. And from then until the end of September the weather was the same, day and night. Hot. Not dropping below 30 C (day or night), and peaking in the mid 40s. Despite this we did very well in our first garden in a foreign climate, especially perennials/ shrubs/ and trees, most of which had been sent by friends as seeds or cuttings, in preparation for when we got our own garden. They had also really impressed the neighbours who hadn’t seen most of them. However, when it came to growing the more important day-to-day stuff, annual veg, it was a very different story. To be totally honest, despite having had plenty of experience I have never had any luck with this kind of gardening, but the darned confusing climate didn’t help either. And failing at something so basic wasn’t helped by seeing our neighbour’s plots rapidly filling into veritable cornucopias. Which in no time they’d be harvesting each morning, literally carrying away baskets and wheelbarrows of lovely stuff. Not only to feed themselves (typically three generations living under the same roof), but all their livestock too, with enough left over to sell at the local market. Plus it was all so healthy looking too. What was it we were doing that was so wrong? Our first clue came when we were given some to try. You know how home-grown has that wonderful smell and taste? This didn’t have either, there was no difference from supermarket/ hothouse produce. Which was another puzzle. Here we have all the classic organic principles at work – irrigating with only the purest mountain spring water; using their own saved seed, sowed only when the sun/ moon/ stars were in the right order; the soil manured with the dung from their own animals and nothing else; plus they’d been doing this forever and it was obviously good for them. Then in the autumn something else equally bizarre happened. Suddenly everyone started sowing for the following year. Now this is just plain crazy. At least four months too early and the freezing cold winter just beginning. Not in heated greenhouses or polytunnels either, where they at least might have some chance against the worst of the weather. But directly into the soil. A hastily cleared patch, no more than 2 m x 2 m, on which all the different seeds were scattered, poured on by the cupful, and far more than would ever be needed or could grow in such a small space. Finished off, by poking freshly cut withies (willow) around half the outside edge, which were then bent over and poked in on the opposite side, creating a rough “bender” framework. On top of which an old sheet of plastic was thrown, weighted down by stones. A makeshift cloche. Total cost: nothing. Labour involved: no more than an hour. This wasn’t the only version either, others used an even simpler method, a polystyrene fish box or small galvanised bath filled with soil/compost and the seeds covered with no more than a layer of twigs or dried grass. That was it, except for taking the plastic off during the days when it got warm enough. There was absolutely no way it could work, but it does and the results are spectacular. By the time they were transplanted, what should have been a spaghetti of light-starved leggy specimens were bright and healthy, completely hardened-off, and eager to get going. So much so that within only a few weeks they already looked ready to crop. Meanwhile I hadn’t even got round to sowing mine yet. When I did though, and irrigating from a seemingly endless spring, it wasn’t long before they started to catch up. And would of, if then the water hadn’t dried up. Which is when I finally worked out the secret of their success and why the crop has no flavour or smell. They are using an ancient form of hydroponics, or as near as. First with the abundant spring water, then when that runs out switching over to an irrigation system which has to be one of the seven wonders of the world. Consisting of a massive water storage tank – at least the size of a municipal swimming pool, and hand-carved from a single boulder, and fed by a stream higher up (1000 m +), that ran all year. Delivering the water to the fincas via a network of ancient stone channels/ canals. All by gravity alone, with the furthest 3 km away. And so well designed that nothing else is required other than a good limpeza (cleaning out) at the beginning of each season. To use it is simplicity itself. You walk the route you want the water to take, and at each junction (with another canal) a handful of soil is sufficient to block off all the others in your favour. This task is performed in the evening, and for us required a walk of 2 km, taking about an hour. The tank is refilled overnight, so just before dawn we would set off to open the sluice. The first time I did this I had no idea what would happen. From the force it came out I imagined the water would get there well before me. But I was wrong, and the longer I waited the less I imagined would finally make it. Even as it rounded the final corner there really was very little to see. Yet unbeknown to me, the downhill journey had imbued it with a momentum unlike any other. And it hit the finca with the force of a tsunami, sweeping straight through, and taking with it all our plants/ seeds, even topsoil. Everything in fact we had spent months nurturing and preparing. One minute there, the next all gone. This only happened to us though. Our neighbours, old hands, were well prepared. Their plots had been dug with really deep canals. Their plants were so well established the roots alone would hold them fast. And as soon as the water arrived they were there with their satchos blocking off each trench as it filled. Not only slowing down the flood but saving every drop, paddy-field style. Because they knew it would be at least another fortnight before their turn for water came up again. Meanwhile, having learnt our lesson, we used that time to set about rebuilding and replanting. The next time something else equally disturbing happened. For which I blame religion, particularly the catholic church, which allows people to get away with murder as long as they apologise afterwards. Because even though this was a small isolated community, one that depended totally on everyone pulling together, there still had to be that one holier-than-thou individualist who felt the rules didn’t apply to them. Who despite having watched us lose everything was arrogant enough to think our water was theirs. And in the dead of night changed all the dams and even emptied the tank before I’d even set out. Not even caring that there was a clear damp trail leading straight to her plots. So who was this sinner? No less than the president of the water users association herself, she who organised the rota of who got what when. She whose marriage had acquired more land than anyone else, sold more surplus at market, and husband was the (indispensable) Mr Fix-it (plumber/ electrician/ builder/ you name it), making them the most influential family in town, next best thing to mafia. Except this time she hadn’t reckoned on the outsider. And what a Viking bloodline and innate sense of fair play can do when roused. Leading to an incident which has probably become local legend by now, along with when our next-door neighbour (the one and only policeman) got so drunk he shot up the local bar. It happened when virtually everyone was just finishing their early morning shift on the fincas, heading home, and pouring down into the one and only narrow path that leads off to the various aldeas. Setting a scene straight out of HIGH NOON. There we all were coming from one direction, then suddenly she appears at the other end. Made all the more impressive because up ‘til then nobody had heard me speak (for which I have no excuse, I’m a man we’re rubbish at learning languages). I still have no idea what got into me, all the spanish I knew was what our inquisitive eight-year-old neighbour Cynthia (daughter of the policeman) had taught us. But suddenly I became eloquent. I spoke in tongues. I dammed her for all eternity and everyone was my witness. After which nobody was in any doubt that this woman had finally been publicly shamed for all her sins. We also never had any further problem with the water. Not surprisingly too, we also added one extra caveat in our search for land, never again to be dependent on anyone else for water. Gardening, whatever the size of your land and wherever it is located, is going to be as much about fighting a war with all the other vested interests as anything else, particularly if the natural order has been disturbed in any way. Add to that the much higher temperatures during the summer, and the range/ size/ and number rises dramatically. Not quite in plagues of locusts yet, but sufficient to keep me awake wondering how to deal with the next one. Colorado beetles were our first taste of what was to come. I remember these from WANTED posters outside police stations as a child, wondering why then an insect no-one had ever seen could be considered dangerous. Now I know. Though it’s not the adults you have to worry about, they’re so brightly coloured and slow it’s really easy to pick them off by the bucket-load (after which incidentally they can be used to make a really good dye). No, the real problem is their offspring. Just like the cabbage white butterfly, you don’t see them until it is far too late. At the other end of the spectrum, size-wise, are the wild boar and deer. Both are really destructive, but each in its own very different way. Boar are diggers, and I kid you not they are like JCBs at unearthing literally anything that gets in their way, even massive boulders weighing as much as 50 kg. The result is that valuable plants are lost and when it rains all the topsoil gets washed away. If you buy land with oaks on it you’ll never get rid of them – acorns being their favourite food. They also like water, so likewise for ponds. Deer on the other hand are relatively light of foot, so don’t cause that kind of damage. Preferring instead to graze on virtually everything they come across. Nothing less than a 2 metre high fence will keep them out. Prior to living here I had very strong anti-hunting/ vegan principles. Not anymore. Not until I have the entire seven acres fenced off. After them comes the badger (singular so far). Slightly bigger than a cat, yet can still manage to squeeze through wire fence, or will simply tunnel underneath. Has a very high level of intelligence/ dexterity/ determination to succeed, plus the strength of a mini boar. Will also turn over plant pots and bite through irrigation pipes. Much smaller is the greenfly. Not strictly a nuisance, as it is the ant who creates the conditions so they can do the damage, but once installed the plant is doomed. An experiment with urine might be an answer. Using a small sprayer and fresh pee (oh yes, why waste it?) and dosing them regularly seems to work and doesn’t affect the plant. The worst pest of all though is neither a creature or an insect, but a plant, two actually. Cistus ladanifer – part of the rock rose family. And Gorse. Both prolific weeds that are a fire-risk and impossible to control or eradicate without spending vast amounts of time and money (brush-cutting, the most excruciatingly job imaginable, or harrowing by tractor). There has to be another way to be rid of these. Any ideas? Long term, but the best I have come across, is distilled from the wise words of Rudolf Steiner in an article by Mark Moodie. Too long here to go into, but also applies to other weeds and insect pests, click here to download the pdf. Other irritations to the gardener but not strictly pests are wasps, horseflies, and mosquitoes. The wasp population seems to grow year on year, and the full range (including hornet and the one that eats bees) exist here. Several times a year they make nests where you live and attack without warning. There is thankfully a simple remedy for this. Fill a large syringe (hand sprayers will clog) with a mixture of water/ clothes washing liquid soap/ chilli powder/ and essential oil, and spray into the nest at night. The horse-fly or black-fly attaches itself to your skin like Velcro and then is totally resistant to slaps/ swatting/ or even treading on (drowning is the only sure method). If not removed immediately the bite will become infected and leave a nasty scar. Mosquitoes aren’t nearly so bad but make up for this in numbers/ persistence/ and irritation factor. Contrary to any claims, there are no repellents, but there are things you can do to mitigate their presence, and over time the body will build up a resistance. Like we made screens for all the windows to keep them out of the house, and got a mosquito net for the bed. Scorpions are in a much more deadly league and no physical barrier will keep them out. I have been stung in bed by one and it is really painful, though not fatal as I was led to believe by the locals. And all I needed to do was take the homeopathic remedy LEDUM 30C to feel better. Since then I have read they don’t like strong smells, so have boxes of lavender and topped up with essential oil placed around the bed. There’s even a snake living in the tool cupboard (now renamed the snake pit), currently 2 m long, but so far hasn’t shown any interest in humans. What else can give a nasty nip is the large centipede, of which there are many in the house. The secret is not to walk around barefoot, or they will certainly try to sting with their tail. Most prolific is the tick. Yes, size isn’t everything and these are truly nasty. One summer when were living in Portugal they bred so prolifically all the outside walls of the houses turned black, and our neighbour and her granddaughter got bitten. She didn’t notice and consequently ended up in hospital. Normally its dogs that get them most (cats have the good sense to bite them off), then perhaps us occasionally. Just to make sure I always check after working in the garden. Thankfully they don’t hurt, and if removed within 24 hrs won’t infect or leave a scar. To get them off is easy, you just have to be careful not to leave any mouth parts attached, just suffocate them. Either with vaseline, or a prolonged squeeze on the head while pulling very gently until you feel the grip loosen. Always check afterwards with a magnifying-glass. One of the real delights of having a garden in another country is how differently they do things abroad. This includes their tools. Number one surprise being the satcho (left in the picture), which is used instead of our spade/ fork/ hoe, being an all-in-one tool like the mattock, and swung as with a pick-axe. This last bit was not so easy to adapt to, as they are deceptively heavy as well (or just very well-made), but the blades do come in a range of sizes/ weights so you can start with the smallest and work up. I have collected several now, including the one with an axe length handle (second left), which with the pick-axe are what I use most to terrace the hillside, all done kneeling so I save my back. Another favourite is the raedera (third from left). This is a real classic. Looks like a hoe, but has a much wider/ deeper blade, so can do really hefty pulling/ lifting. Mostly used for repairing the forestry track, once I developed the necessary muscles to lift it. Not spanish or even unusual, but an essential everyday tool nonetheless, is a pair of reliable secateurs. Up ‘til recently I relied on the WOLF brand, as I’d used their tools for the last 25 years and they served me well. However, when the blades on mine got so there was nothing left to sharpen with, it was rather annoying to discover they do not sell replacement parts. Particularly as this pair, while over 15 years old, were still in perfect condition otherwise. So I did some research, for brands that do supply spares, and came across FELCO range, plumping for their No2 model. What a difference! The blades on these are not only razor-sharp by comparison, but made from an infinitely better material. But what has impressed me more has been their after-sales service. You wouldn’t expect to have any need for this when buying new, however unwittingly I made the big mistake of purchasing through Amazon. Who it seems have quite a reputation for selling counterfeit copies of many products. I had no idea of this at the time, just that they didn’t feel right, and as this was more of a niggle than an obvious fault, sent an email to the company. The following day a representative phoned me at 9am from Switzerland. Two days later, when the spanish importer failed to contact me (not surprising) a replacement pair were despatched from Switzerland, free of charge. Even Amazon don’t respond that promptly or with such little hassle. Am one very satisfied customer. The other most regularly used items are saws and loppers. These three featured are in daily use, throughout the year, for weed removal. Originally I started off with a petrol brush-cutter and chainsaw, but hated them so much evolved to these instead. A lot more work in terms of time, but without any of the stress/ pollution/ or cost. Plus I can now see exactly what I am doing, which means a lot more self-seeded trees gets a chance to grow, and they for some reason seem to be impervious to the wild deer and boar, whereas the trees I grow from seed get eaten straight away. The saws shown are both incredibly cheap (typically 5 euros), the loppers more (about 30 euros) but you can replace just the blades later. I sharpen them all after each use, which takes only a few minutes, and for this use a very cheap but brilliant flat chainsaw file (3 euros). This is really easy, but if you can’t work out how send me a message and I will try to explain. This monster is the answer to a chainsaw. Three foot long, kept sharpened, and with enough stamina, a single person can cut through a foot diameter of living wood without effort. For the less able a handle can be fixed onto the other end for two people to share the effort. Cutting firewood is job that should be done throughout the year, to avoid it becoming a chore. What would make it a lot easier though is a portable saw-horse (to take to the felled tree), and is something I hope to have made up in metal when the finances allow. The most bizarre tool I have ever encountered has to be the hand plough, which must have originated in France as the only ones we’ve seen are homemade and belong to neighbours who worked there, though there is a spanish company now who produce a very expensive version (http://www.ecoprac.com). Fashioned originally from old bicycle frames – the front wheel and forks removed/ handlebars turned right round/ crank & pedals taken off/ then a bracket welded to the bottom of the frame to take those Wolf-type of interchangeable garden implements, or ones from a small hobby tractor. You grab the handlebars, back wheel leading, and push/ pull. Makes short work of hoeing between rows or digging the perfect irrigation canal/ planting trench. 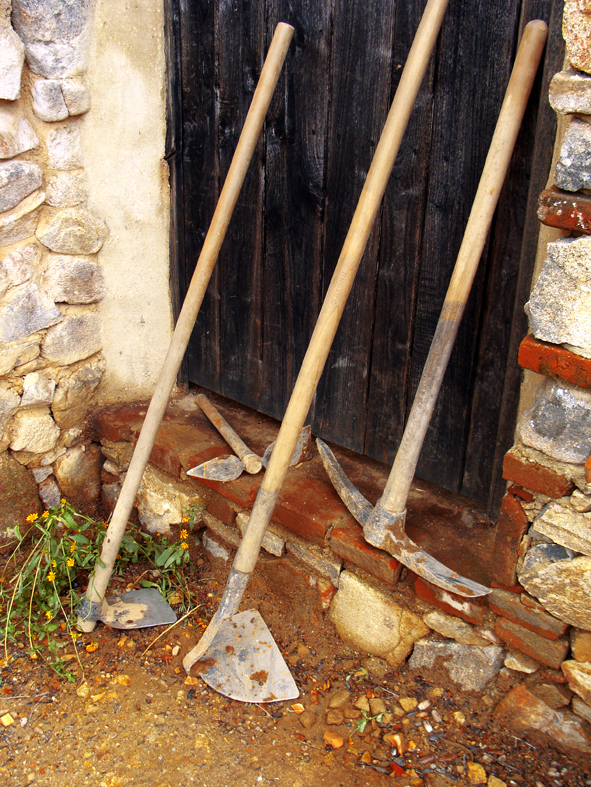 Tools were the first thing that attracted us to consider Portugal, or rather the ironmonger shops (oddly enough called drogarias), which we discovered on an exploratory trip over the nearby border when living in Galicia. We had gone to see if the small town there (Ponte da Barca), only 5 km away, would serve us better than the 120 km round-trip we and everyone else had been making to the nearest spanish town (Orense). I can’t imagine why we hadn’t thought of going there before, apart from an initial impression the people there were rather fierce/ wild. We’d see them in the local bar/ marketdays/ and at fiestas. The men especially, who looked literally like Mexican bandits. Very small, plump, sporting huge bushy black Zapata moustaches, bad teeth, and dressed in very nasty suits circa demob. Just like gangsters. The only thing missing was a couple of bullet belts and a sombrero. They also liked to drink, starting early (in the morning) and continuing until they dropped. Actually that area of Portugal (the NW) could be Mexico, especially in the summer when it gets so hot everything turns to dust. It’s also a very poor region. The buildings and roads have been crumbling away for centuries from lack of government investment, the transport system is virtually non-existent, there are no large shops, so you really are stepping into another era. Yet despite all that the people there are a lot friendlier and far more interesting than back in Spain. What we noticed first were the bars, which not only serve a much better espresso (and at half the price), but have cakes as well. Even now, seventeen years later, apart from in one bar in Sevilla, we haven’t had a single decent pastry in Spain. Even more amazing though are the veg/ produce markets. In Pont da Barca, in the old town square, it is packed out with individual producers who’ve all brought a couple of baskets of their current surplus. All freshly picked that morning (the Portuguese get up very early and work almost twice as long/ hard as the spanish), a vast range all-year-round, and their baked goods just blow you away (spanish bread anywhere is totally inedible). Though, as I said, it was their ironmonger shops which finally convinced us, that we’d be a lot better off living there. Each is family owned, unique in what it sells (no chains of diy outlets here), and a veritable Aladdin’s cave. Not only stocking everything you’d ever need (for the garden or home), but many oddities we still haven’t a clue what they are for. Northern Spain has these too, even where we were living in the mountains, and I still regret not having bought more of the wonderful (and cheap) wooden plates they use there for eating the prized boiled octopus (pulpo). But for choice and value Portugal wins hands down. Much of it handmade locally and with impressive craftsmanship/ ingenuity. Like the galvanised bucket which has a watering-can rose fitted underneath and hangs from a tree serving as a shower. Watering cans made-to-measure. Irrigation pipes fashioned from bamboo, spliced with copper fittings. Pot-bellied cast-iron wood-stoves. And our all-time favourite, the carro, which is their version of the wheelbarrow, but with two wheels and a lot more versatile. Talking of which reminds me of yet another major influence on me, my nan and granddad (Rooksby), whose frugalist life set such a profound example. Granddad had a job but he never bought stuff new (except their one and only house). He visited auctions and made what he needed. And of course had several carros, for carrying stuff to and from the allotments. The Portuguese version though is the ultimate in design and function: made from steel, and can be pulled/ pushed/ or even towed – either by bicycle or as is more common, behind one of the thousands of ancient eastern bloc two-stroke motorcycles/ tricycles that somehow still manage to live on, perfuming the air with that unique smell of burnt engine oil and audible several kilometres away. Further east in Portugal, still on the border, is the spa town of Chaves, and there is the Fortnum & Mason of hardware shops, one dedicated solely to the art of wine-making and distilling the wonderful local brandy (aguardiente). Why can’t the rest of the world (especially anyone involved in promoting ecology) see this is the way to go? That we should boycott those soulless hangars full of useless chinese crap, and support the return of these (not just whole-food or bike coops). Establishments staffed by people who are dedicated to the art of self-sufficiency and able to help you find what you really need. Situated local, in the high street, within walking distance, for when you’ve forgotten something yet again. Willing to repair rather than make you buy new. And sell exactly the number of nails/ nuts/ bolts/ screws/ washers, instead of blister packs or boxes. This is the true sense of a community. Not having drive out to a factory unit for everything. Finally, while I’m on the subject, a last word on the use of mechanised machinery versus hand tools. Ever since I bought my first Stihl strimmer in the 1980s I’ve had this deep feeling that trying to speed up or simplify a job by using a petrol-driven alternative is wrong. Now I know why. Apart from the costs, which often are exorbitant, and the health risks which are many, it simply isn’t sustainable. Trying to create a neat and tidy efficient monoculture, just so you can grow a particular crop to excess (make money from it) is wrong. Nature is all about infinite degrees of diversity, wild abandon, and the interdependency of the species that dwell there. When Maureen died I had to sell off all my remaining power tools, to raise money to live off. Learning instead to do those tasks by hand. This was not an easy transition, but has been possible. I can now brushcut as quickly as a machine, with a handsaw and shears. Saw firewood fast enough to keep up with our needs. It simply takes time to develop the relevant patience, muscles, and rhythm. The best part though, was a recent discovery that this reaps benefits too. For on the land which has been regularly brushcut or overgrazed, since I stopped using a machine (which is totally indiscriminate), there have been useful plants/ trees re-emerging. And unlike the ones I’ve grown from seed they seem impervious to the deer and wild boar. That gut feeling Maureen had when we first viewed El Pocito, that it could be reforested (which I didn’t share, it looked too dry and arid), has been proved right. Just needs time and care when weeding. Don’t be afraid of chaos, it is natural. For footwear I’ve been using the HARRIS & VIKING DRY BOOTS for 25 years. There’s nothing like them. A cross between a wellington boot and lace-up walking boots. Made entirely of rubber, totally waterproof, with a great grip on slippery/ steep/ and rocky surfaces, warm in winter, cool in summer (even at 40C here), and totally comfortable (even straight from the box). 2.5 hectares (that’s about 6 acres) set in 182,000 hectares of pines/ oak/ sweet chestnut/ apples/ vines, as well as many other kinds of tree. The whole of this region hilly, and El Pocito no exception, with at least 100 metres difference between the top and bottom of the land. The contour of the plot resembles an amphitheatre, so wherever you are it is possible to be heard and usually seen too. The house is tucked away into the hillside at the top left-hand corner. The land has a long history. There are prehistoric remains nearby, drystone terracing still remains, ancient olives, and in living memory it has been used as a pine plantation then for oaks to fatten pigs with (Jamon is the major local industry). When we bought it the impression was of totally barrenness, nothing growing but a few oaks and a lot of dust. Except for a tiny area in the middle which for some reason had a look of wilderness about it, where there were wild figs/ grape/ rose/ and brambles. This, and the name (which means little well), gave us sufficient confidence to go ahead with the purchase. Later we discovered there was plentiful water close to the surface, and also that one of the main reasons it looked so awful was the local habit of dehesa, which means harrowing out all ground plants each year to keep it looking clean, leaving only the trees. The house is at 600 metres. Above (to the NW), and outside the plot, the topography continues to rise, reaching about 900 m at its highest point. This has been very useful as it keeps out most of the colder/ stronger and colder winds from the north. The downside is it delays the sun in high summer (especially when we want to use the solar panels). To either side (SE & NW) the height remains about the same (600 m), with the neighbouring pine plantations offering shelter from wind. In front of the house (SW) the site drops away steeply, with a river just beyond the bottom that flows most of the year. Wind from this direction is rare, but when it comes, either from the Canaries or N Africa, this usually means trouble. The panoramic view though from here is what everyone notices. From the patio and inside the house there is this amazing vista 180 degrees that on a clear day allows you to see as far as the Portuguese border (60 km away), all of which is more or less uninhabited (by people). The topsoil of the site is a form of sand, which I prefer, as this is really easy to work in the winter (the coolest time), turning rock hard in the summer (when it is too hot to do much anyway). Underneath this are a wide variety of substratum, a mixture of crumbly orange rock/ granite/ and clay. When we arrived the entire surface was also covered with millions of small rocks/ boulders. A nightmare to walk on, especially on the steepest parts, but has proved invaluable for building projects and creating swales/ terraces. Climate is often glibly referred to as Mediterranean. But that is meaningless, for in the nearby town of Almonaster (a couple of hundred metres as the crow flies), they have completely different weather/ growing conditions. To me it feels like Cornwall, but a lot hotter from June to October. Winter is probably the same though, with rarely any snow or frost. Spring is the most beautiful time. Summer is like a sort of winter, nothing grows. Autumn being like a second spring, when everything comes back to life. Our plan from the very start was to plant/ grow a WILDWOOD. As in an arboretum for large permanent trees, and when that was established, filling in the spaces underneath with as many smaller trees/ shrubs/ perennials/ and wild annuals under its protective canopy as possible. There was no specific design. And this was intentional. I have been gardening now for more than 25 years and learnt from hard experience there is no system man has ever invented that works anywhere, the only way to work with land is to do it intuitively, let nature tell you what it needs. Eventually this will provide all our food/ fuel/ medicine/ plus whatever else we currently have to earn money to buy. 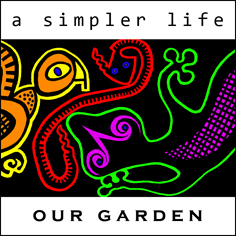 What I (and Rudolf Steiner worked out first) consider the only sustainable way of life, where you take only the surplus. Where no nothing is brought in/ sold out, and the needs of all the other interdependent species/ biodiversity are equally respected. I’ve deliberately chosen to use the term wildwood, instead of the better known term forest garden, for two reasons. First because I am not keen on being associated with what is currently being touted as FG (likewise Permaculture), because to me (apart from being no more than a get-rich-quick pyramid scheme) it totally fails to take into account the sustainability factor. For me, tinkering away in back gardens/ allotments, or buying up tracts of land to do the same while living elsewhere, is no more than making a personal statement, this is not acting sustainably. Wildwood therefore is about living with and for the benefit of nature and all living things, not them for us. Secondly, I wanted to get away from any association with the term forest or forestry, as this is definitely not in any way sustainable, but simply blatant destructiveness. The difference is easy to spot. Plantations, where almost everything is planted uniformly, usually with just one or two species, and a scary absence of anything else growing/ living within them, is where the species chosen are generally as far away from what could be deemed natural as it is possible to imagine, bred specifically to crop in the shortest possible time and with the least need for inputs. These “forests” simply exist so the owners can make a quick profit and we can have yet more pointless products aka IKEA/ equally unnecessary and unwanted packaging/ and provide poor quality overpriced fuel for pellet stoves and power stations. All negative to life, but permitted because vested interest, those who rule over us and have been making the lives of the majority a misery throughout history, has all the power. Hoodwinking us the daily more gullible and stupid, with reassuring labels such as renewable resource (which couldn’t be further from the truth) and certified (conservation grade/ organic/ bio-dynamic/ agroforestry/ commercial forest gardening/ or whatever other scam that has since been invented). Whatever their claims it’s simply about making money. A lot of it. And as quickly as possible. Wildwoods also represent our only hope for a future. By that I mean if we want our species (as in those of us who are alive right now) to survive extinction, we have to start re-planting them now. It may seem odd to say we only have perhaps a few years left, but it is true. In the last 50 years alone our global population has not only tripled, there are many of us now as have ever existed. And to support that unsustainable figure we have been systematically destroying all other species, the one thing that gives everything on this planet life (the eco-system). That invisible but complex organism which has over billions of years created all life, an infinitesimal number, the vast majority of which have never been identified/ seen/ or still exist. This is biodiversity, that unique ecological system the planet created for itself, long before we came along, which we rely on/ need to provides us with enough clean air to breathe/ healthy food to sustain our bodies/ and pure water to re-energise with. Up until 10,000 years ago that amazing system was still functioning perfectly. But then we were just a tiny part of it, with only 300 million of us in total. A time when we still knew our place in the grand scheme of things, concepts like poverty had yet to be invented, the need for any kind of infrastructure/ planning/ or other kind of organisation had not even been considered, no-one needed to supervise anyone or anything, there was no dividing up of land, no ownership, no homes/ tools/ language/ gods/ or money, and no-one even spent a single second of their life in labour, certainly never for someone else. Until someone somewhere came up with the idea of imposing their pinhead logic on everything, no doubt because they wanted to be rich and powerful. From that the disease spread, unchecked, exponentially, until what we are left with now is a very little and life as we know it about to cease. Unless we wake up and stop this craziness. Just think about the place where you want to plant and imagine it as a three-dimensional world (of plants) made up by seven different vertical layers. Layer 1 being the tallest and widest trees. These go in spaced apart so they’ll leave enough room in-between for the next layer to grow, (2) the mid-sized trees and large shrubs. Between these go the ordinary-sized shrubs (3). Followed by perennials and self-seeding annuals (4). Underneath which are the ground cover plants (5), and the roots (6). The remaining layer is the climbing plants (7). You can use my (click to download) plant list to help you choose which plants, or get a copy of Ken Fern’s book PLANTS FOR A FUTURE (ISBN 1-85623-011-2). He’s another luminary of mine, the driving force behind the PLANTS FOR A FUTURE project in Cornwall, and has produced the most comprehensive and easy to understand public access database on the subject yet, available online at http://www.pfaf.org/ for free searches, or even better as a download/ CD to use at home. During our first summer (2009) very little got done, there were just too many other more pressing things to attend to, and the heat was a problem, plus the sheer scale of what to do with six acres. We couldn’t even decide where to start, so even by the winter we’d only managed to plant about fifty fruit trees, bought at a market in nearby Portugal. All of which then promptly got eaten by the local deer. Up ‘til then I’d been gardening for 25 years and had never realised that in real nature you simply cannot do whatever you like, a theme which has stayed and developed, influencing the way I now work. My reaction then though, was to erect a fence. Luckily we had very little money left so could only cover a small area, about one acre. The most obvious place to put this being around the house, for while it was not the best land, in fact the very worst, from previous experience I knew it was important to keep the journeying back and forth down to a minimum, especially on a steeply sloping site. The one good thing to come out of this was it got us started finally, providing the much needed focus. Work began in earnest, with me creating terraces (everything is a lot easier on the flat, also helps with soil erosion), and Maureen on our vegetable plot. By the next summer (2010) we’d learnt a lot about our new environment, especially how it not only lacked virtually all the conditions needed for growing any kind of veg, but bought-in trees don’t do so well either (they have been used to being pampered). Which prompted another time and money wasting mistake, installing an irrigation system (described later). The plan to grow all our own veg was put on hold until the trees could provide sufficient shade and fertility. I concentrated on the terracing, all done by hand (pick-axe) and growing all the trees from seeds. The following spring (2011) we got a hive of bees (also described later). And by the summer felt finally acclimatised to the summers. Work began on a pond for grey water treatment. The previous owner had dug one using a JCB, but it had vertical sides, which during torrential rain collapsed, filling it up again. That had to be dug out (again by hand), terraced, then planted with trees and reeds to hold it together. One of the trees planted there is now 5m high. During 2013 Maureen’s cancer took over and work on the garden came to a halt. Then she died, and I found it hard enough to tackle the ordinary tasks of daily life, so by the end of 2015, the sixth year, progress had slowed dramatically. 95% inside the fenced-in area was roughly terraced, but there was still lots more to do to get them perfect, which I discovered then included sloping them slightly backwards to retain the rainfall. That winter more of that was finished. By then there were about 500 new trees planted (all from seed), with a 2 metre space between each for shrubs to go in later. Then came the summer of 2016, which was the hottest here ever. I wasn’t watering anymore and a huge number of the trees died, or I thought they had, for most shed their leaves very early on. Some subsequently recovered the following year, others were replaced with remaining nursery stock, and the rest will be from grafts, using the apple/ loquat/ citrus, which were totally unaffected. I guess because they love their roots have found the natural water table. In 2017 all the terracing work within the internal fenced-off area was finally finished. The rest, the other five acres, has been worked on too. In March 2015 a new law came into effect in Spain which meant I had to create and keep clean a fire-break around the entire perimeter of the land. As I no longer (want to) use petrol-driven devices on the land this has all been done by hand. No mean feat, on top of everything else, but with merely a handsaw and long-handled shears to start with, then just secateurs, it has actually been possible, with only an hour a day. Creating at the same time not only a lot of useful brushwood for the stove, but thanks to rediscovering my ancient copy of ANOTHER KIND OF GARDEN, by Ida & Jean Pain, who had a similar garden (though slightly bigger at 241 hectares, in Provence in the 1970s), compost too. 2017 was definitely the best year of the previous ones. And I would never have guessed what look so dry and dead when we moved in would be so green and lush in such a short time, especially as now there are no inputs or irrigation. But it has. In fact, the areas left to regenerate naturally, those outside the deer/ wild boar protected zone, saw the best recovery, with literally thousands of new trees and shrubs reappearing (probably after being dormant for decades), and this despite heavy grazing. Nature really does know best, even more than permaculturists! Another discovery has been the importance of shade plants, especially getting them established first, instead of what I did which was to concentrate on trees first, thinking their eventually larger canopies would do that job. Annoying to make such a fundamental mistake, especially after so many years gardening, but that’s life, every piece of land is unique so no-one can get it right first time. With summers here being generally very dry and hot the obvious answer was to irrigate, but having set that up it didn’t take long to realise that unless it was on 24/7 it was pointless. Mulching was out of the question too, far too much to cover, a very steep slope, and strong winds. So it did have to be done by planting, but with what? Once again I have tried everything, and finally getting results. English (not the native spanish) lavender, and rosemary so far have proved hardy, not requiring any watering. The latter more so, as lavender does seem to have a tendency to commit suicide for no reason, whereas rosemary is bombproof, and in autumn cuttings from those can be taken, to keep it from getting too leggy and snapping, which will all take and be ready to plant out the following year, all without any need for any attention or watering. Last year for example I stuck four inch lengths of the tops into a wild patch of ground (do not weed them either, shade is essential) and 200 new plants were created. My most startling discovery though has been about the right way to plant trees. After over 27 years gardening, organically, I thought I knew everything, especially having grown from seed and transplanted at least 5000 trees just here. But then only a tiny proportion of those actually survived, so obviously I wasn’t that good. Now I know why. It wasn’t lack of irrigation, but that the roots couldn’t get down to the natural water-table fast enough to feed themselves, penetrate the complex layers of bedrock that lie close to the sandy surface here. What I should have done therefore (what a wonderful/ irritating thing hindsight is) was drill a one metre hole for each, using an auger/ post borer, followed by adding compost. Half way through the summer of 2018 and it is the mildest in the eighteen years I’ve seen in Iberia, more like spring never ended and just went to autumn (which is like another spring here). We had the wettest (and mildest) February to July for decades, with the first real hot day not until the 17th of July. No-one can remember it being like that, at least not since the 1950s. And it is at odds with climate change too. This area, the Sierra de Aracena, seems to be the only place in Europe not to have increased in temperature. Very odd, but the plants/ wildlife/ and residents are not complaining. Everywhere is so lush and green. And at El Pocito in particular there have been wild herbs and other annuals previously not seen before, all truly spectacular. Even trees I thought were long dead have put up new shoots. And for the first time the vine plants have tiny fruit. Maybe there is a god, except surely he wouldn’t want the gorse to still grow back so quickly! Christmas 2018. Autumn this year was the wettest for a long time. Incredible to see so much green, and plants still growing. It has remained mild too, sufficient to have the door open all day and only light the wood stove later in the evenings. But the most spectacular thing has been the mushroom harvest. Usually this goes on for about a month, this time it was almost three, and there where so many (both types and quantity) that it was only necessary to search within a 20 metre radius of the house for enough to eat. Sweet chestnuts were plentiful also, and the pine nut harvest looks like being just as good too. I finally managed to get an auger, and started to plant the trees raised from seed in pots. It was a bit late this year (2018), due to all the rain and problems getting hold of one here, which was a worry because I like to get all this kind of work (tree planting/ transplanting) done in November so the roots have time to grow before the summer, but there were so many waiting it was fairer to take the risk than suffer the stress of another year in pots. Well it is hard work. The soil here changes by the inch. The first hole was a cinch, all done in a couple of minutes. The second hit rock, start again a little further away, hit rock again, eventually it took me three hours. The third hit clay, which I hate, nearly gave me a hernia trying to lift the thing out each time. Eventually though it all got done. What was interesting, was there was always soil over. Then when it rained the plant/ hole dropped by that amount, which allows more rainwater to collect and provides a bit of shade, as well as marks where they are, because now I don’t weed it can be hard to see the trees for the wood. What might be a unique event has just happened. In February (2019) one of the lemon trees, planted in 2010, reverted to producing oranges. Apparently this is impossible, even though the rootstock is probably wild orange, as it has to be either from a shoot below the graft, or the graft has to die, neither of which is the case here. Every year up ‘til now it has had only lemons, and many, this year its all oranges. Though good news in one way, because none of the twenty or so orange trees I planted that same year has ever fruited. March 2019. All the trees transplanted with the new “auger method” have survived and are in leaf. Same success with the grafting. But best news of all is the arrival of a new visitor, an otter, seen here in this video just 5m from the house. Why here, is a complete mystery, there are small rivers nearby but nothing to have sufficient fish, perhaps this one is a vegan, like Woolley our black & white cat, prefers fruit. Postscript on the “otter” sighting. Apparently it is a mongoose. Well, whatever, impresses me. One more creature living in El Pocito. Of specific interest are the olives, which are a particularly old/ hardy/ and vigorous variety. I first thought there were about a hundred (half of which would fruit in any year), but I think now there may be several times that as full-size trees and many hundreds more growing. Just coppicing/ cleaning a few has already created enough firewood to last us a whole winter (it is the best fuel for a wood-burner, pine being too greedy and oak too slow). The fruit to supply all our needs for eating. And if we had a small press (the next project) to be self-sufficient in oil too (1 ltr requires 6 kgs of olives). I have also been planting vines (or to be totally accurate, cuttings), for some time, with the aim of making our own wine. Not something we had thought of initially, but a gift from a very dear friend in Galicia, an organic grower, who sent us a parcel of cuttings from his finca, got us started. Red for wine, and white for eating. This was in January 2011. Sadly, even though they were all heeled in upon arrival they must have dehydrated en-route because most eventually died. However the idea has stuck, and the following December we went in search of replacements. This time in Portugal, where our old neighbour there, only started at the ripe old age of 72, with just 40 plants, and now aged 83 has multiplied those to 700 (all by cuttings) and while his vineyard only takes up about an acre, though not to waste any valuable space he also grows vegetables between the rows, each year makes around 2000 litres of the most palatable wine I’ve ever tasted. Cuttings from those were planted out immediately on our return and despite the dries winter on record enough survived for me to take a few cuttings each year. 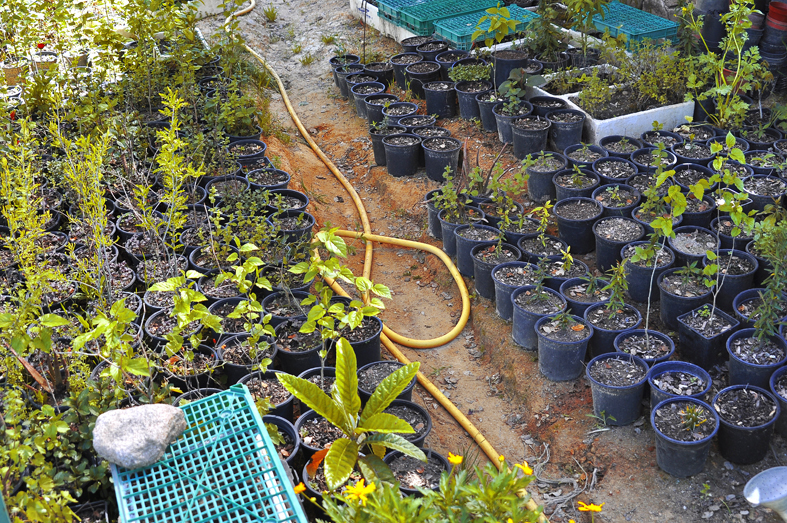 Currently there are about 20 healthy specimens with as many new ones ready to plant. Another possibility is making incense/ charcoal/ perfume. The Moors (when they occupied this area) planted cistus ladanifer throughout for this purpose and El Pocito has plenty. And that is it currently, as they say, a work in progress. Each year closer to harvesting by foraging alone, more and more of our needs for food. 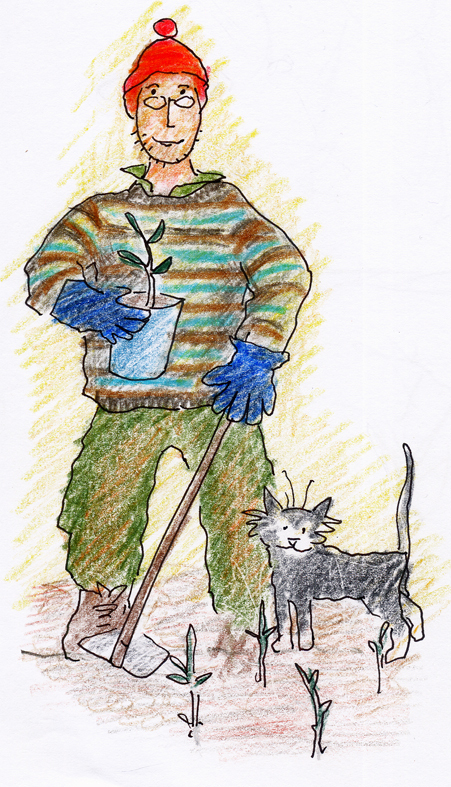 To plant fig trees in front of the house as the first job. I saw them growing at an old house in Monchique and they gave the perfect shade in summer, as well as cooled/ moistened the surrounding air, plus gave off the most wonderful fragrance. To save seeds from all the fruit I eat and can find locally. They germinate and grow much better than bought seed. To forget about trying to make the garden look neat and tidy. Chaos is how stuff survives in the real world, all plants have their useful purpose/ point in the diverse sustainable scheme of things. To install straight away a massive polytunnel frame with shade cover, because trees in pots do not survive these kinds of summers, and essentials like comfrey/ nettles/ and mints (+ many important herb annuals) need constant shade/ water all year round. agrimony, avocado, blackberry, catnip, chamomile, chrysanthemum, cistus, cleavers, comfrey, echinacea, evening primrose, fennel, giant hyssop, gorse, grape, guava, hawthorn, heather, hemp agrimony, honeysuckle, hyssop, jasmine, lavender, lemon balm, lemon geranium, lemon grass, lemon verbena, lime, liquorice, mallow, marigold, mexican tea, milk thistle, mint(s), mountain grape, nasturtium, nettle, olive, orange, passion fruit, peach, pennyroyal, perilla, pine needles, plantain, portuguese green tea, raspberry, rosa rugosa, rosemary, rue, sage, self-heal, st john’s wort, strawberry tree, spanish tea, stevia, wild carrot, willow, wild strawberry, wormwood, yarrow. At the beginning we bought about 100 trees and shrubs. All from semi-local companies. Of those I reckon 20 have survived but none have grown any faster than trees we later started off from seed. Why? Because commercially-grown stock is raised in a totally artificial environment, so when you subsequently plant them out they suffer shock. If you are thinking of planting up a large area quickly, bear this in mind, and only buy from a dealer who is close by and grows outside with the minimum of inputs. Or better still from seed. A lot cheaper, very easy, and the plants have fewer problems adapting when they are finally transplanted. There have been only two problems with this. The first is bought seed tends to be of poor quality and low germination rate (unless you have green fingers), then will die anyway without subsequent irrigation when planted out. Therefore it is always best to forage for local fresh seed rather than buy. The other is the choice of varieties. I’ve spent many years researching and honing the ultimate forest garden plant list (click here to download), now running to over a thousand different varieties, but only a tiny percentage of these are actually available as seed alone (it is far more profitable now for businesses to sell plants only, which of course will all die). I am sure with the internet there will be more possibilities, but low germination/ eventual survival will still be a big issue until the canopy is fully grown and fertility is restored. Even saving pips/ seed from fruit and germinating those is a good way to start, because even though they won’t come true they can still be used as root stock for grafting. Tip – when sowing pips remove the shell first (if it has one). Tap gently with a hammer until you hear it crack. Sow immediately. Protect from badgers and mice. Tip – you can sow seeds in pots, but they do better in the ground. Sow the latter in autumn, when the soil is nicely damp and the ants have all gone. 1) take an empty plastic drinks bottle (500 ml – 1 ltr). 3/4 of the way up cut round with a knife. 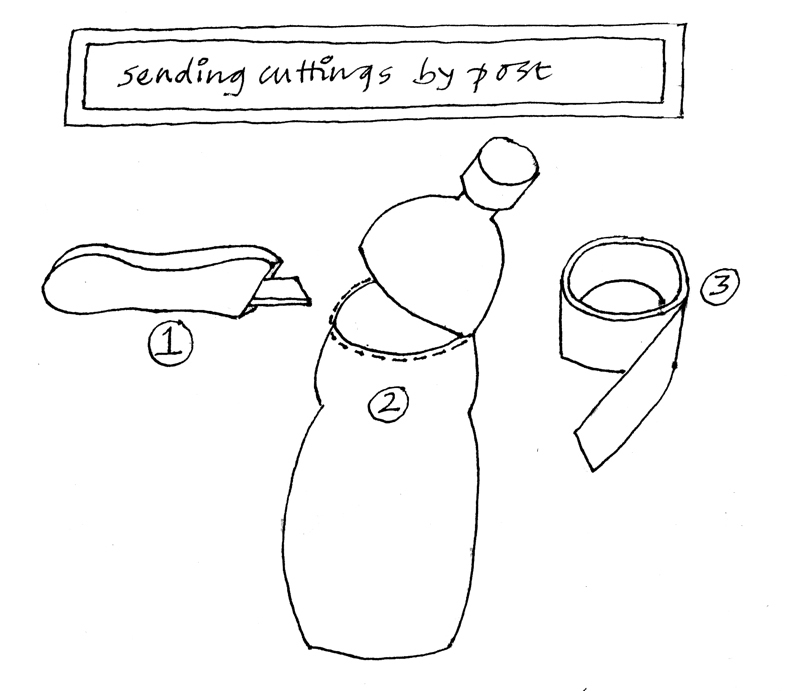 2) insert cutting in the larger part, along with some lightweight material to keep it damp. 3) replace top and re-seal with wide sellotape. 4) wrap in a couple layers of newspaper, securing with sellotape. Apart from a disastrous flirt with leaky hose in Yorkshire (total waste of money, don’t be tempted), I had never used a watering system, prior to when we lived in Galicia. After that, in Portugal, we devised something along the same line as the canal system we used there, but fed from a nearby spring. Here it has not been possible to either. And in our first summer we used our waste water and a watering can instead. At the time there weren’t that many plants so this was adequate, but it was still a job that seemingly took hours each day and of course involved a lot of walking up and down hill. Something better had to be organised eventually. You’d think by having our own borehole we’d have endless water. Seemingly, but to me it seems wrong to use water of drinking quality when rainwater is usually sufficient. Also it would significantly shorten the life of the expensive pump. What we should of done was install rainwater harvesting, off the roof. Somehow that evaded us completely (we didn’t have any spare cash either) so mistakenly we came up with a system based on drip-feeding. It cost then around 0.75 euros a plant (for all the bits), delivered 260 ml of water per plant each day, and utilised gravity so no extra pump was required. Comprising: a main 40mm pipe, which runs from the top of the fenced-in area, following it round to the bottom, a distance of about 100 m. Off which are spurs at each terrace that run horizontally in 16mm pipe. And at approx 2 m intervals an even thinner pipe branching off, attached to a tiny stake, to water each plant. We ran it just after sunset, for four minutes, giving the plants all night to take the water up. This system was in use for three years then I decided to stop watering altogether, as it would prevent the plants from seeking the water table naturally. It was a scary decision but paid off. The infra-structure however can be re-utilised very easily to provide automatic watering should we in the future find the time to grow annual veg, once a rainwater storage system has been installed. No garden is complete without at least one hive, preferably two. And in spring there isn’t anything more wonderful than the sound of their loud humming as they visit the wild spanish lavender and st john’s wort that springs up everywhere. When we lived in Yorkshire we built three hives and homed several colonies, many from swarms, but did nothing more. Having settled in here, and totally replaced our need for sugar with honey, it was therefore time to learn more. And a hive with a colony was bought from a nearby bee-keeper. This turned out to be one of the big mistakes we’ve made, along with the decision to buy a brush-cutter, which eventually I had to sell as my back couldn’t take the strain. The bees here couldn’t be more different than the ones we had in the UK. They are much smaller and really aggressive, so much so that you can’t have a hive anywhere near where you might want to work/ be. The local beekeepers aren’t that much better either. We’ve had two come and visit, and they were both equally nasty, very bossy, and with no respect for the bees. The honey they took though tasted wonderful. And that has been it to date. We keep our distance. Until have a lot more tuition/ back-up (books are no good for this kind of thing). If you happen to be a nice friendly bee-keeper and would like to help please get in touch. To become truly sustainable we need to deal with all our waste on-site, leaving nothing to add to municipal landfill. So far it’s down to about one small carrier bag’s worth a fortnight, as virtually everything brought in either has no packaging or can be recycled here. Weeding and leaves go in one heap, to mulch down slowly. Hardwood prunings/ cistus/ and the tops of coppiced trees, elsewhere, which after two years are brittle/ dry enough to snap by hand to be used as kindling for starting the wood stove. All kitchen waste + ash from the wood stove + humanure + wee has a heap of its own and is used solely for fertilising the area of herbs around the house. This has been one our successes, providing usable material in just three months. It’s also been simplicity itself. The first version was just an area of soil, approx one metre wide at the front and two metres to the back, located a short distance from the house. Around which was laid a dry-stone wall, about a foot or so high, to stop the wind blowing stuff away. That’s all. No concrete base, no cover, no divisions, nothing else. And oddly no smell either. Maintenance was equally simple. Everything got dropped in at the front, then when this pile reached the height of the wall (about 3 months), dragged back to the middle. After another 3 months the same process over again, this time with the middle pile going to the back. After nine months in total the back pile is taken away to be used. The only things that didn’t compost were hair (doesn’t ever seem to break down) and large fruit stones (which clog the mincer if I want to use that to make seed compost). The location was a problem however, to get to it you needed to negotiate a very steep and rocky path, lethal in the dark and wet, so it was moved. And at the same time changed the design. Now it is a circle of reinforcing wire (used for casting concrete and comes in 2 metre x 1 metre sheets). About 1.5 metres in diameter. Around which is attached some shading material to make it look unobtrusive and stop material falling through the large mesh. This is situated about 10 metres from the house and still there’s no smell. The actual composting process varies throughout the year. Slow in winter and incredibly fast in summer, and by fast I mean in a few hours what has put in is unrecognisable. A new heap is started when this one is full, and the composted material is left until the winter before applying (as it is too dusty at any other time to sift out any un-composted bits). The only disappointment has been the quantity it produces. Given that several kilos of matter go in each day (including urine) the annual total (for two people) is only enough to cover 10-20 metres2. Nowhere near enough to grow annual crops, though vindication for our original idea of wanting a forest garden instead of an allotment. This is one of the most essential plants in any garden, and you can never have too many plants. Virtually unheard of in Spain, so we asked our friends Sue & Chris of Devonshire Mill (http://devonshiremill.co.uk) to send us some of theirs. They all survived and when there is sufficient shady areas we’ll be splitting them to make more each year. This is a new thing for us, but turns out to be so easy I wish we’d tried it earlier. The first plants we attempted were rosemary and lavender. We did this over successive months between Dec & Feb, simply by cutting the fresh growth (about 3-4 inches) and putting them in pots of leaf compost (you can also just stick them in the ground). Kept damp they were ready for transplanting the following autumn. I think probably any woody shrub could be done this way. We also buried the ends of trailing plants, while still attached to the main plant, and they rooted too over the same period. We then experimented with fresh leaf cuttings, from softer stock/ perennials – chocolate mint/ sage/ and lavender – but this time in early summer. The lavender all died, but the other two, in homemade propagators made from 5 ltr water bottles, fared better. All the mint, and about three-quarters of the sage. Full shade is essential. This has been new to me too. When we lived in Portugal all our neighbours did this as a matter of course whenever they came across wild rootstock, so as there are many vigorous/ suckering fruit trees here it seemed crazy not to have a go. Trying to discover how though, has not been easy. The internet was far too complex, just put me off. Then one day, having mentioned it in town, two local “experts” turned up to show me how. That was in 2012, in March, and budding then had already started. They picked trees with a trunk of about 2-3 inches wide, sawed them to around 3-4 ft high, and removed all the side shoots. Then across the top of the cut made a slit with a very sharp knife, into which was inserted a temporary wedge (or chisel) to hold it open. A cutting was then taken (from a similar tree but with edible fruit), trimmed to about 4-6 inches long, the ends sliced to form a wedge (the same depth as the cut) and slotted into place. One on each side, and so the edges were both flush to the outside of the host. The wedge was then removed and all the exposed bits were bound in electrical tape to keep them from drying out. I was impressed, it seemed so easy, but sadly none of them took. The following year I tried the same method again, but this time using used clay to cover all the exposed areas, bound with strips of damp thin fabric. Of about five, one of those took, and a year later fruited. The next year I tried something radically different and all my own idea. First the timing. I started in January and did one graft every week or so until the buds began to open in the spring. Choosing the rootstock and host of a similar width. Slicing each at a 45 degree angle with a sharp (kitchen) knife, then tying them together (see photos). First with an elastic band, then plumber’s ptfe tape, and finally raffia. This was really quick and it felt like the right method, but from ten grafts I only got one. This was an apple (which fruited too), and makes me think the species is probably just as important. The following year I did it differently again. Using a scalpel made a cut into the rootstock, then cut the graft in a vee shape, inserting that into the cut. Followed by tying as above. Timing was done by asking someone in town, around March I think, later than I imagined, and the budding didn’t occur until May. Out of ten I got eight that took (a couple with fruit too). The ones that failed were on thick or tall rootstock, so perhaps the younger the better. I also lost the original graft to some kind of fungus inside the branches, it just rotted away, but only on the graft, not the rootstock. Weird. A friend in California, with 42 years experience with grafting apricots, has published a useful guide. Download the page from his site by clicking here or go direct and look for the relevant blog. He has also recommended another site, click here to download a pdf of that as well. In an ideal world such nasty/ polluting/ carcinogenic/ and potentially maiming tools would never be allowed. I started out with one too but very quickly found out how dangerous they can be and sold it, replacing the job of cutting firewood with handsaws. To save others who haven’t the patience here are some tips picked up. 1) before doing anything go on a proper training course (usually 2-3 days). Your local Agricultural College should be able to tell you where. It’s not cheap, but like being taught to drive there is no other way to understand all the risks safely. The course also includes maintenance, itself worth the outlay, so make sure you take plenty of notes and a camera, because you soon forget this stuff. 2) buy the heaviest/ most powerful model you feel able to carry, as this governs the thickness you’ll be able to cut. Buy it from a local dealer, as you will also be needing their help at the beginning, especially with chain-sharpening and servicing. Which brand to choose is a problem, none seem to be worth the exorbitant. Here everyone favours STIHL so I bought one of those. Waste of money, total crap. 3) as well as the saw you will need suitable protection – special chainsaw boots/ chainsaw trousers (don’t get the dungaree version)/ chainsaw jacket/ chainsaw helmet (with metal screen visor – not a plastic one) and ear defenders/ chainsaw gloves (wear latex ones inside those to protect your skin from oil/ petrol). 4) plus the appropriate file/ tool for sharpening the chain teeth + a 5 ltr metal can (plastic rots) for the fuel. 5) before starting ALWAYS check the following – that you’ve cleaned and replaced the air filter/ the brake is on/ the chain moves easily on the bar/ and the retaining nut is fully tightened. Do not leave with fuel in the tank if not in use for more than a week or so. 6) my biggest mistakes: ignoring smoke and subsequent scorch marks on the bar (due to insufficient oil reaching the chain – solved by drilling a larger hole where it feeds the chain). And not understanding how to sharpen the chain. The latter is really hard. Even the experts will tell you totally different methods. The best answer is to buy an attachment that fits on the chain (see photo) and acts as a guide for the file. But it’s not foolproof. The instructions are almost impossible to understand and moving the chain along is really fiddly. Still, this way you can’t go too wrong and you can see what needs to be done. Make sure you have the right size file. Note the teeth are arranged alternately, so you have to do half working from one side then change over to do the other. You are filing them horizontally whilst at the same time at an angle (mine is 30 degrees), yes confusing. Start off by marking the first one with a bright colour felt pen. File away from the motor and only in that direction. No more than one or two passes (the metal they are made of is really cheap/ soft). Make sure you only file the tooth, not the chain (it has to be a minimum of 1 millimetre higher). And brace the whole thing in something like a vice (which I haven’t worked out how to do yet) whilst you are doing it. You also need really good eyesight. When you do get the hang of it you should be able to do without the aid, and simply sharpen by balancing the saw on its handle, attacking one side at a time. Even marking should not be necessary then, as you’ll be able to recognise where you’ve been by the shine on each tooth afterwards. Do this EVERY time you finish using the saw (which for me is after 1-2 tanks of fuel). 7) other maintenance tips – when filling with petrol ALWAYS top up the chain oil reservoir at the same time/ wash the air filter after each session (in soapy water)/ change the petrol filter annually/ and ALWAYS have someone nearby when you are working, just in case of an accident (I wear a whistle as well). Have you tried the hugelkultur system (basically burying logs in your raised beds) which according to hearsay is meant to reduce or eliminate the need for irrigation? In my limited experience it seems effective. Hello nice to read all this nice information! and to know a bit more from your life. I have a question. Why not the use of animals? as for the compost, plague control, and even food? (even if you dont eat them, they are very helpfull in managing your land safely and in the nice nature methods, and always bring some more company) All the best of luck in your search for a better lifestyle, a big hug from José, Alentejo, Portugal.